Sandy Hill, Year 6 teacher at an international school in Zurich, attended our Reading for Pleasure CPD and shares how she's using what she learned in her classroom. I teach a Year 6 class in an international school just outside Zurich, where we offer the three International Baccalaureate programmes to our students. Our school population comprises of 55 nationalities and we have a policy of accepting all children whatever their English speaking or learning ability. It had been an intention of mine for a couple of years to make reading a focus and this academic year I looked for a workshop to make it a reality. Having looked at several, the National Literacy Trust’s Reading for Pleasure course was the one which grabbed my attention. During day one, it was reaffirming to realise that I was already doing some ‘right’ things. 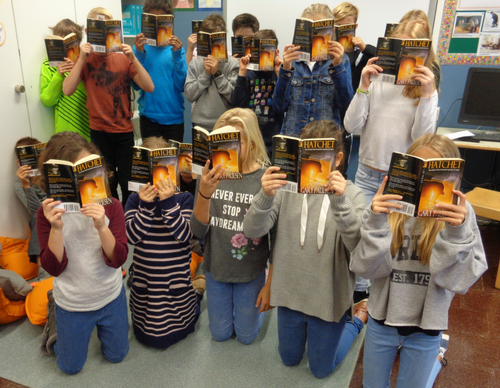 For example, my class has a daily silent reading session of about 15 minutes in which I read too, usually a book recommended by one of my students, I read to them at the end of the day, and on the wall we have a list of books recommended by the school librarian and another list which the children recommend to their classmates. I also have the children present book shares where there is a particular focus. So far we have specifically studied plot and conflict. The children choose their own book but it has to be approved by me first. Their projects have to be different for each of the three presentations, and the final one will focus on characters and theme. What I really liked about the workshop was that the activities can be used in a non-British national curriculum school. Something as simple as getting the children to have their photo taken while reading in an unusual place proved to be fun. A real hook was the ‘page 99’ technique. It generated a lot of discussion about what might be happening in the story and about the author. Next, I read the first chapter to them and, again, it whet their appetites to read on. The excitement built until I finally revealed that we would be reading Gary Paulson’s Hatchet together. They all but cheered with the relief of finding out! Other activities which they enjoyed were finding synonyms, choosing alternative verbs in a closed procedure, selecting a chapter and using the text to write a journal entry, which linked to work we had done in English. When the book was finished, in pairs, the class plotted the story onto a plot mountain, linking with the first book share. I contacted the parents of the children who had identified themselves as reluctant readers to find out if they had noticed any difference in their child’s reading habits. I was delighted with the 5 out of 7 responses who commented their child was now reading for pleasure. We will be starting a new class read soon and the children are already excited at the thought of starting The Breadwinner by Deborah Ellis. I have decided to repeat many of the activities outlined above and introduce one or two more. Find out more about our Reading for Pleasure CPD.